The majority Democratic San Diego City Council, in a 3 to 1 vote last week, directed city officials to draft an ordinance requiring contractors competing for city projects to disclose any past and present work, as well as planned bids, on parts of Trump's planned border wall. "Trump's border wall does nothing to promote San Diego's robust economy and our positive international ties with Mexico," Council President Pro Tem Barbara Bry, a Democrat, said in a statement. "Our region is stronger because of our cross-border exchange with our neighbors to the south." Councilman Chris Cate, a Republican who cast the only vote against the action, said the ordinance would create a "bad precedent" aimed at shaming employers and their employees. "These folks rely on jobs to provide for their families," he said. The city of Berkeley last December approved an ordinance that would bar it from engaging in any business with companies involved in the border wall's construction. 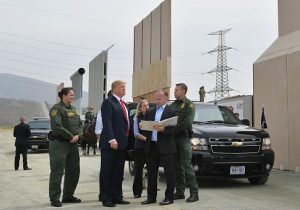 Los Angeles unanimously passed a less aggressive but still punitive rule in April: All contractors who work with the city or are seeking to do business with it must disclose whether they are helping in any way to design, construct, operate, or maintain a "federally funded wall, fence or other barrier along the border between the United States and Mexico." Republican Congressional leaders over the weekend tried to tamp down Trump's threats of shutting down the government if Democrats refuse to vote for his immigration proposals, including funding the border wall. "I would be willing to ‘shut down' the government if the Democrats do not give us the votes for Border Security, which includes the Wall!" Trump tweeted Sunday. "Must get rid of Lottery, Catch & Release etc. and finally go to a system of Immigration based on MERIT!" "We need great people coming into our Country," he added. Senate Majority Leader Mitch McConnell (R., Ky.) downplayed the potential for a government shutdown, which would take place Oct. 1, the end of the fiscal year and just weeks before the midterm elections. He predicted a shutdown wouldn't happen and also said the border wall wouldn't get funded before the midterms. Speaker Paul Ryan (R., Wis.) said the funding for the wall was "not a question of if, it's a question of when," but also said Trump is "willing to be patient to make sure we get what we need so that we can get this done." The blacklisting of the border-wall builders is just one prong in California Democrats' Trump resistance movement. Democratic activists in the state are hoping to leverage high-profile clashes with the Trump administration over immigration, oil drilling in California's offshore waters, and the prospect of loosening federal pollution rules on cars, to help flip GOP congressional seats to the Democratic column. Some of the cities boycotting these contractors also led the "sanctuary" campaign against the Trump administration's efforts to crackdown on illegal immigration by barring local law enforcement from communicating with the Immigration and Customs Enforcement agency and other federal immigration authorities. Assemblyman Phil Ting is also behind the blacklisting campaign. Earlier this year, he also introduced a bill that would require all of California's government pension funds to divest from any company involved in building the wall. "This is a wall of shame, and we don't want any part of it," Ting said in a statement when he introduced the bill. "Californians build bridges, not walls." A representative of the group, a vocal proponent for abolishing ICE that also launched a "sanctuary everywhere" campaign, was the only member of the public to address the San Diego City Council during its meeting in late July.